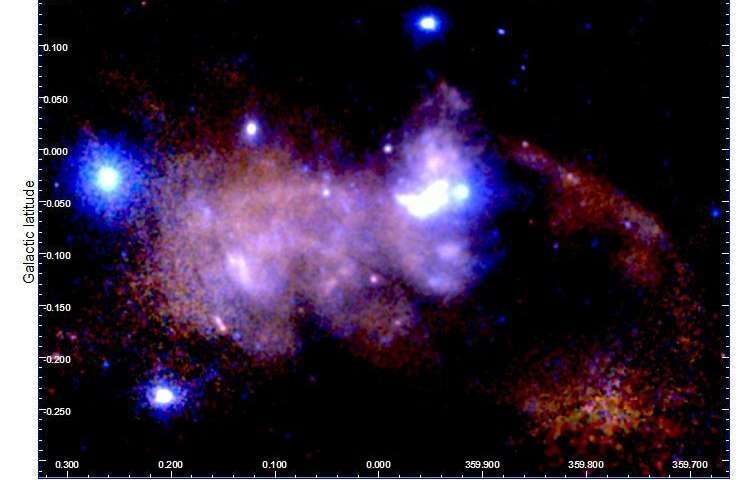 An international team of astronomers at the Max Planck Institute for Extraterrestrial Physics has been scouring cosmic images of X-ray emission, hunting for elusive clues that reveal the culprit responsible for violent acts that have left deep scars on the heart of the Milky Way. The prime suspect is the supermassive black hole lurking at the center of the Milky Way, with a number of massive stars also implicated as suicide bombers. 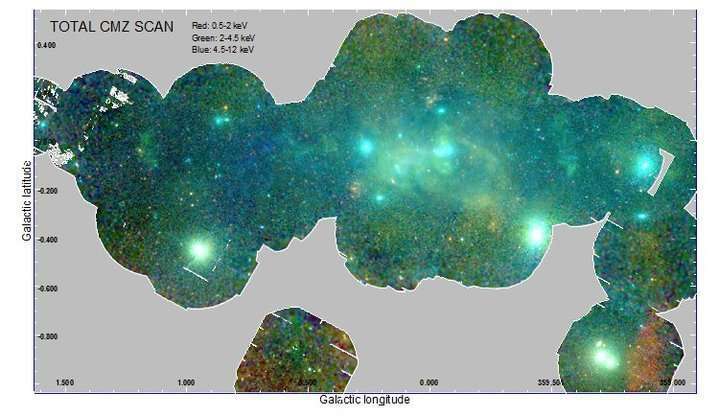 The X-ray broad-band mosaic image above is from more than a hundred individual XMM-Newton observations within the central degree of the Milky Way. The colors indicate observations at different energies; this map covers a region about 500 hundred light years across. In addition to the X-ray emission from the regions around the supermassive black hole at the center of the Milky Way this map reveals X-ray binaries, star clusters, supernova remnants, bubbles and superbubbles, non-thermal filaments and many other sources. Zoom into the central 100 light years of the Milky Way center, where here only the soft X-ray emission is shown. The Galactic black hole and its surrounding emission are located in the brightest central region of the image, and the bipolar lobes appear above and below that location. ESO: "An Entire Spiral Galaxy Fell Through the Center of Massive Elliptical Galaxy M87"